 Mercy Aigbe’s claim to fame is being an actress. But ask several of her fans out there, and they would tell you that her impeccable style is also one of the reasons she’s famous. It goes without saying that she pays special attention to her appearance. Even when she is not attending events, she ensures that she looks her best at all times. She has a penchant for experimenting with whatever she puts on, and she doesn’t discriminate between traditional and foreign outfits. A lot of times, Aigbe steps out in intricately designed ankara outfits. Mercy’s style shows that it is not about what you wear, it is about how you wear it. A lot of blogs and style aficionados often post pictures of her in different attires on the Internet, for readers to take a positive cue from. Aigbe who also goes for lots of designer outfits, doesn’t spare any cost in making sure that she gets the best. Ever since she made a fashion statement at the Africa Magic Viewers’ Choice Awards last year, she keeps replicating the glamour she brought to the red carpet. This year, she wore a stunning red figure-hugging dress to an industry event and this singular act like others before it, reaffirmed her stylish disposition. It is being whispered in some corners that people are now scared of inviting Ebuka Obi-Uchendu to their weddings and other events. This is because, whenever he attends events, his style often overshadows those of the hosts. That was exactly what played out at the traditional wedding of singer, Banky W, and his actress wife, Adesua Etomi-Wellington. Obi-Uchendu stepped out at the wedding looking all shades of dapper with his unique style ofagbada. The agbada instantly became famous as it dominated headlines for a while, even after the wedding. The tailor who made the agbada was identified as Ugo Monye. However, the incident at Banky’s wedding isn’t a one-off thing. Obi-Uchendu is one man that often gets it right with his style. His tall height is often a perfect canvass for whatever choice of clothing he decides to go for. Partly because of his job, he mostly favours suits, and his shoes are always carefully selected. This year, it is safe to say that Ebuka put a lot of ‘pressure’ on Nigerian men to up their ante when it comes to style. Actress, Rita Dominic, has been ‘slaying’ since she got into the movie industry. Known for her impeccable style, she never seems to have an ‘off’ day. Whenever she steps on the red carpet, paparazzi and fans jostle after her, to take pictures. Mostly garbed in long-flowing evening gowns with elaborate and eye-catching designs, she shines like a diva in all the attires she wears. However, she can also appear as casual chic when she feels like it. She sometimes steps out in tracksuits, joggers and sneakers, which give her a sort of tomboy feel. Not one to be boxed to a corner, Rita is also known to experiment with different themes when it comes to fashion. On some occasions, she adopts the street style and this transforms her looks, making her look like a thoroughbred ghetto babe. But most times, Dominic goes for the posh lady look. On those times, she looks like she just stepped out of a fashion magazine. She pays attention to even the smallest details, from her makeup to the straps of her shoes. This year, Dominic continued to set trends and turn heads. She is undoubtedly one of the style shakers who reigned in the industry. At the 2017 Africa Magic Viewers’ Choice Awards, her gold coloured floor-length dress by Lanre Dasilva Ajayi, was a winner that night. Deola Ade-Ojo is one of the most popular names in the Nigerian fashion industry today and that’s for good reason. She has been in the fashion business for about 25 years now and her consistency has never been in question. The highly creative Ade-Ojo has always championed African designs, and she has represented the country at several high profile fashion shows across the world. This year, she shook the industry withKomole Kandids, a new style series that uses ‘authentic African fabrics of antiquity; bringing together the contemporary and the traditional in a unique and fresh way.Komole was well accepted by fashion enthusiasts, especially the affluent. 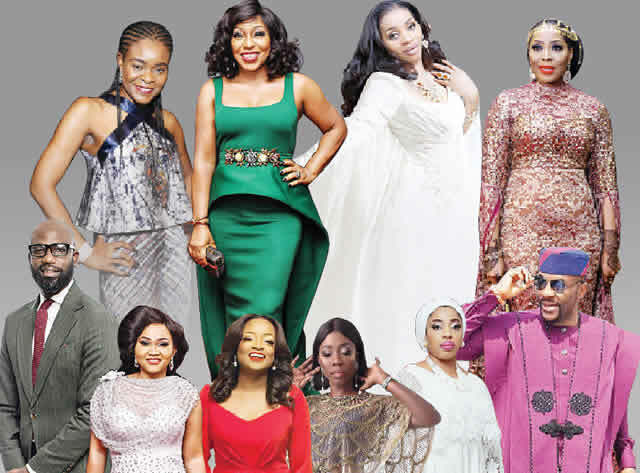 A lot of popular personalities, such as Olori Sekinat Eleguishi, Fatima Bashir, and Stephanie Coker, are some of the people who made fashion statements in Komole Kandid designs. Ade-Ojo’s personal style is fun, funky and fabulous. Blessed with physique that makes her look at least 10 years younger, she won the heart of many with the several pieces she has rocked this year. A favourite remains the elegantly designed komole- styled top and wrapper she wore to a wedding in Lagos a few months ago. Mosunmola Abudu is a well known media entrepreneur. It is also not a secret that she is a very stylish person. A judicious businesswoman, Abudu does not seem to have a favourite mode of dressing as everything she wears sits well on her body. This year and like previous years, she has made numerous fashion statements. Her profound love for striking designs easily makes her a stylish personality. She took her fashion game to a new level in 2017 when she mandated guests to dress in Arabian-themed outfits to the premiere of The Wedding Party 2 movie in Lagos. Abudu turned out gorgeously dressed and looking like an Arabian queen at the event. She wore a brown floor-length gown made by Lanre DaSilva Ajayi. Her outfit as well as that of several guests gave fashion enthusiasts something to talk about. 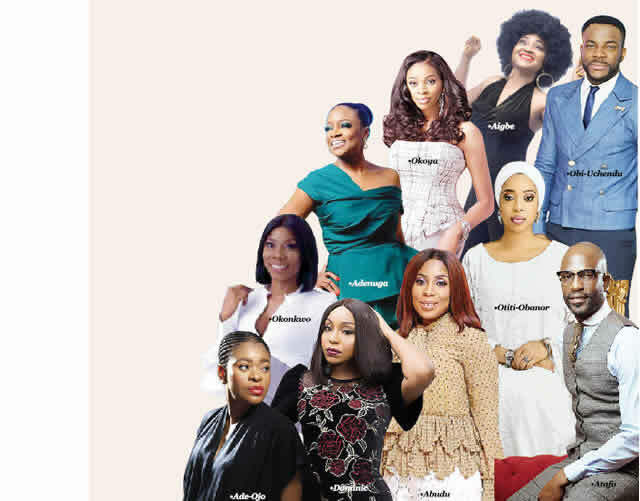 Innovation seemed to be Abudu’s watchword this year as regards style. It is unarguable that the youngest wife of billionaire entrepreneur, Rasaq Okoya, Sade, is one of the best dressed socialites on this side of the divide. She surely knows how to capture attention, and she does it effortlessly. Aside from her spectacular beauty, she has a compelling style. Whenever she steps out, you can be sure that she would be dressed to the nines. With a very good taste in fashion, Sade only goes for exclusive items that engage the mind and eyes. Her beautiful figure ensures that whatever she puts on clings to her like second skin. This year, she set the fashion circuit agog with her outfits. She also favours bold jewellery, and she spares no expense in making sure that she adorns some of the most elaborate and beautiful pieces one can find. Formerly married to the Ooni of Ife, Oba Adeyeye Enitan Ogunwusi, Zaynab Otiti-Obanor, is one lady that is very particular about her looks. While she was married to the Ooni, she was always dressed in white, and continues to do so. Her love for white outfits does not limit her fashion choices. She emphasised her love for regal outfits by often dressing in flowing boubou and kaftans. She embraced the use of different textures of fabrics to achieve different looks. . She usually pairs her outfits with top-of-the-line jewellery, bags and shoes. Even though she is no longer a queen of Ife, Zaynab’s style is still impeccable. Whenever she is seen in public, her fashion choices often leave people in awe of her spectacular taste. A recent example was when she met with United Arab Emirate’s Minister of Economy, His Excellency Sultan Bin Saeed Al Mansoori. She was attired in two-piece white apparel and a gold brooch. Business executive and one of the glitterati, Oyin Adenuga, does qualify to be addressed as a style queen. A daughter of billionaire, Mike Adenuga, her fashion sense can be described as exquisite, classy and bold. She got married in the year, and it was yet another opportunity to emphasise her style. Changing into a total of five outfits on her special day, her outfits were the talk of the town for several days. Her cobalt blueKomole outfit was outstanding. Her style is neither loud nor eccentric. Making fashion statements with high-end wear and accessories, she has a penchant for standout pieces. No doubt a trendsetter, she remains one of the best dressed in 2017. Mai Atafo came into the fashion industry with a bang, and he has continued to cause ripples over the years. His bespoke tailoring has helped him to carve a distinct identity for himself, and this separates him from the pack. Unlike some others in the industry, he didn’t just stumble into this profession. Atafo trained at the Leeds-based Saville Row Academy, and the quality of tutoring he got there is evidenced in all his apparels. With the brand name, Mai Atafo Inspired, his products are hard to miss. He has a way of making his customers look like human mannequins with the way his outfits sit perfectly on whoever wears them. Apart from being a good tailor, Atafo is also a good model for his wears. Some of his most outstanding outfits this year are those he sported at a photo shoot to celebrate his birthday this year. Wearing white, black and grey colours, he looked grand in his knee-length agbada. Ogugua Okonkwo is the one behind Style Temple, one of the most prestigious fashion houses in the Federal Capital Territory. No wonder her style is a perfect blend of style and sophistication. She is effortlessly fashionable and loves to wear timeless and classic pieces. Catering to the elite in Abuja and other major cities in Nigeria, Okonkwo pulls off every look. She understands her fit and sticks to it. She showcases her exquisite taste in clothes whenever the opportunity presents itself. A few months ago, she wore a tasteful gown to the wedding of the Ararume twins in Abuja.